Burnout Extreme Drift is a cool racing game to drift around at high speeds like a maniac. Customize your car and take it out to the tracks to race against other competitors or to show your drifting skills. On the drift mode, the more you drift the higher your score, so use your handbrake like a master to burn those tires and set the highest scores possible. Earn money to buy new awesome cars and don’t stop until you own them all. Burnout Extreme Drift will satisfy your thirst for speed with this thrilling racing and drifting game. Drive amazing and expensive super cars on the road against other opponents. Will you be the first to finish in Burnout Extreme Drift? 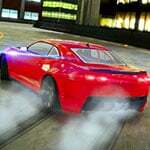 Burnout Extreme Drift Game is one of our Racing Games at Round Games. It is also tagged as a car and drifting game. To play even more free games, view our most played and all games pages. If you want to play more games like this game: Then you can simply check out the games inside the game tags that are the most relevant to your interests. Or check the Racing Games category or check the related games section at the end of the game page. Also make sure to check out Burnout Drift Game, you may enjoy playing it.